The FL-T200 Fuel Tank provides fuel to liquid fuel engines, like the LV-909, attached beneath it. The FL-T200 Fuel Tank is a liquid fuel tank available only in the paid version. Like the FL-T400, it can power liquid fuel engines. It provides thrust for a short duration that may be extended by stacking multiple fuel tanks on top of each other. 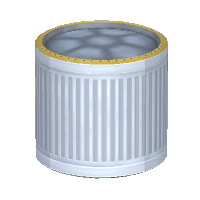 It can be attached to radial decouplers and the sides of other fuel tanks. With a propellant reserve of 200 liters, one tank can power a single LV-909 engine for up to 56.5 seconds at full thrust. 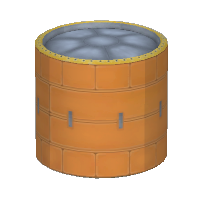 Unlike the FL-T400, the FL-T200 is best used for Mun lander/return stages, and low energy orbital maneuvers. While it no longer offers inferior performance, the simplicity and reduced wobble risk from using fewer larger tanks is quite helpful. 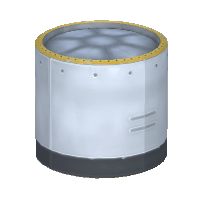 “ The T200 tank had some difficulty being accepted in the spacecraft engineering world, because most rocket builders had trouble overcoming their urges to squee at the "cute little fuel tank". This initial reaction was only put aside when the amount of fiery explosions in assembly areas became so high, strict guidelines were put in place to prohibit "teasing the fuel containers". The T200 Tank now is widely used in several space programs and does a remarkably good job, if assembled politely. 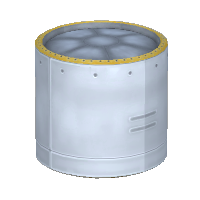 As of version 1.5 this fuel tank has four textures that can be switched in the editor. This page was last edited on 26 December 2018, at 17:33.